When Emma Sirignano, ’15 J.D., first came to Notre Dame Law School, she was initially interested in copyright law. She took the semester-long Intellectual Property and Entrepreneurship Clinic class, where she worked on copyright status pieces for a nonprofit client and also worked on trademark applications for clinic clients. This experience increased her awareness of trademark law and opened her eyes to other opportunities in intellectual property law. Sirignano is now an examining attorney with the U.S. Patent and Trademark Office. 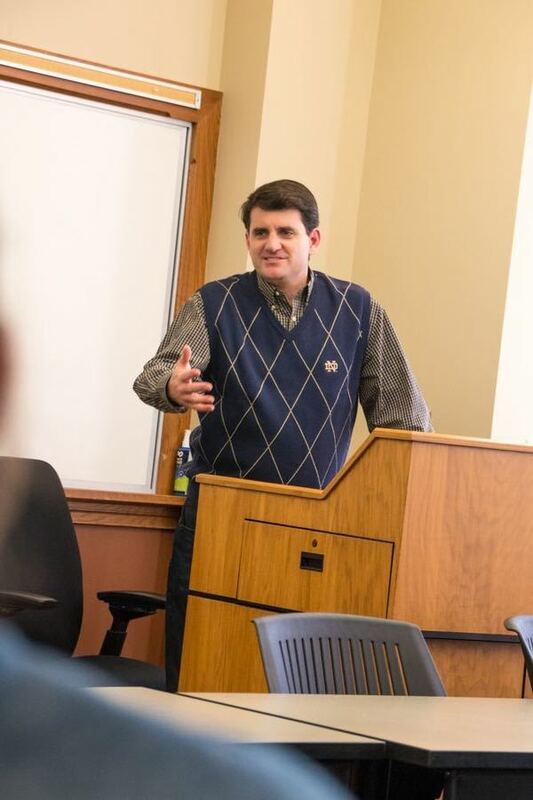 Brendan Regan, ’94, ’98 J.D., speaks to students February 8, 2018, at Notre Dame Law School. // Photo by Alicia Sachau, Notre Dame Law School. She first heard of a trademark examiner when she attended a lecture by fellow alum, Brendan Regan, ’94, ’98 J.D., who is also an examining attorney at the U.S. Patent and Trademark Office. “I had never heard of a trademark examiner until I listened to the talk by Brendan and it definitely sparked an interest,” she said. Regan attended Notre Dame Law School before the IP and Entrepreneurship Clinic existed, but he still credits the Law School’s classes, especially his Patent Law professor, for sparking his interest in intellectual property law. He has been an examining attorney for most of his law career and enjoys the independent, procedural, and research aspects of the job. He speaks annually to Notre Dame Law students about a day in the life of an examiner. He is happy when he has provided that inspiration to students and can expose them to what the job is all about. The Intellectual Property and Entrepreneurship Clinic provides students with valuable experience in applying substantive intellectual property law to client problems, and offers assistance to businesses and entrepreneurs with counsel on intellectual property related issues. Students work under the close supervision of the clinic Director Jodi Clifford, a patent attorney who has substantial private practice experience. Originally published by Denise Wager at law.nd.edu on February 08, 2018.